Thirty-five percent of global food production benefits from insect pollinators, and U.S. farmers have relied exclusively on European honeybees, whose populations have been in decline for decades due to colony collapse disorder. "Because production of our most nutritious foods, including many fruits, vegetables and even oils, rely on animal pollination, there is an intimate tie between pollinator and human well-being," said Mia Park, Ph.D. '14, an assistant professor at the University of North Dakota and the paper's first author, who worked on the study as a Cornell entomology graduate student. Co-authors include professor Bryan Danforth and associate professor John Losey, both in entomology. "With honeybee numbers in decline, relying on wild pollinators and encouraging the services they provide seem very important," Park said. The researchers studied 19 New York state apple orchards over two years, 2011-12. They determined the health of bee populations by analyzing the numbers of wild bees and honeybees and the number of species for each orchard., They also created an index of pesticide use from low to high use, then quantified the amount of natural areas that surrounded each orchard. "We found there is a [negative] response of the whole bee community to increasing pesticide use," Park said, adding that fungicides also are contributing to the problem. The effects of pesticides on wild bees were strongest in the generation that followed pesticide exposure, Park said, possibly suggesting pesticides affect reproduction or offspring. Park said her research only looked at one generation to the next, and more study is needed. The study found no effect of pesticides on honeybees, but European honeybee hives are brought in to an orchard for short periods during blossoming then removed. In addition, growers are careful not to spray while honeybees are in the area. "Honeybees may have shown a response if they were allowed to stay," Park said. More study also is needed to understand the effects of fungicides, though the researchers suspect the effects may be less direct, with possible harm to larvae or to microbiota that aid in digestion or to bees' ability to recognize their nests, Park said. The effect of greater surrounding natural areas proportionately diminishing the negative effects of the pesticides could be because more natural habitat leads to more bees around an orchard. Even if some die, others are available to pollinate, Park said. Natural areas also may provide a refuge for bees against constant exposure, as opposed to areas where neighboring fields also are farmed and sprayed, she said. "Our studies of wild bees in apple orchards are showing how important wild bees are for apple pollination in the eastern U.S.," said Danforth. 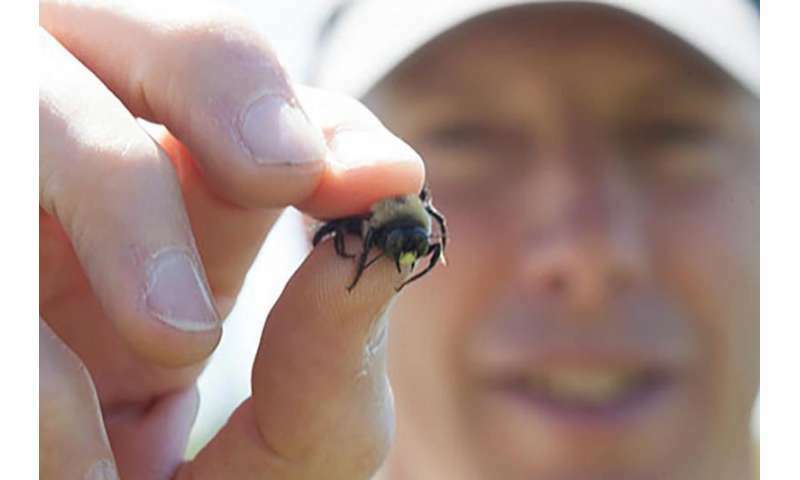 With more than 20,000 known bee species, native bees are abundant and diverse in many agricultural habitats, and likely pollinate watermelons, squashes, blueberries and other orchard crops, he said.